I was recently contacted by Canadian Wildlife Magazine about photographing Tim Nelson for a feature in their upcoming issue. 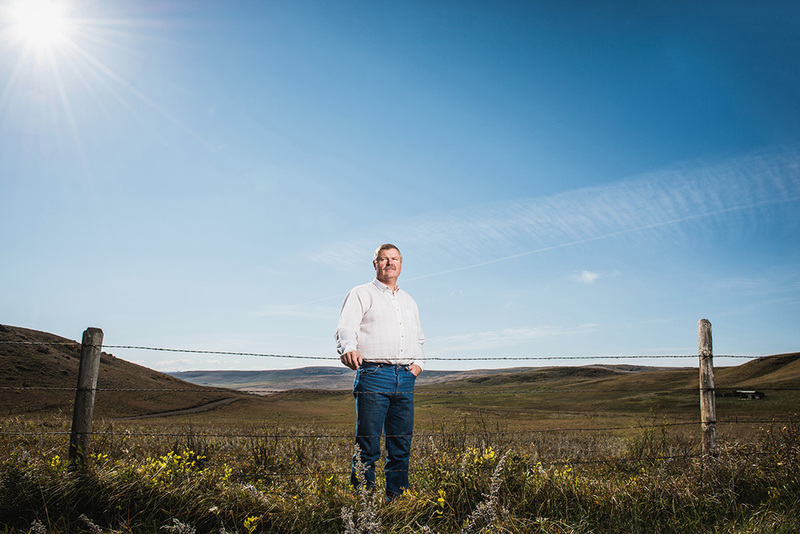 When I was given the assignment, I was told that the story revolved around a landmark agreement dealing with 30,000 acres of grazing lands, and that Tim, who is the chair of the Waldron Grazing Co-op, was the lead negotiator in striking a deal with the Nature Conservancy Canada. Before we arrived at Tim's ranch, I knew that for the shot I wanted a fence, a clear shot of the prairies, and that I wanted to shoot into the sun so that I could use it as a rim light. Fortunately it only took about 15 minutes to find a location that hit on all three points, the downside was that it was crazy windy out that day, and the wind would end up blowing directly into the face of my 47" octa-box. With 3 sandbags weighing down the base of my light stand, and my assistant holding on to the octa-box with both hands, we popped off a total 32 frames and that was a wrap. These are a couple of my favorite frames, which the magazine didn't choose so I can show them. I'll update when the magazine hits the shelf.